I purchased my first home at age 27 when I was still single. I purchased it in the spring of 2003 from a sweet, elderly widow named Doris, who didn’t have the time or ability to maintain a home and yard anymore. Her husband Arthur had passed away the previous autumn, and she was moving into an assisted living facility. I moved in with my sweet, elderly kitty Zorro, and set about decorating the home to my liking. 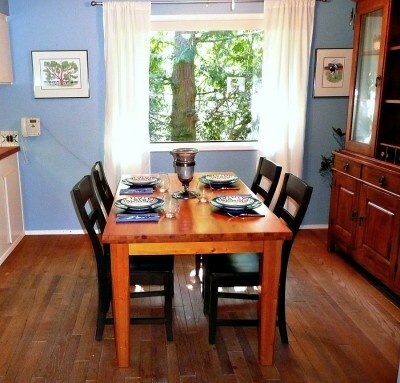 It was a peaceful, charming little rambler on a small lot in the middle of town, three rooms deep on each side. The right side, front to back, was living room, dining room, kitchen, while the left side was bedroom, bedroom, bathroom, bedroom (yes I know, that is technically four, but you get what I mean). Running down the bedroom side was a hallway that connected all the bedrooms, with a entry between the living room and dining room. One morning a few months after I moved in, I was eating breakfast at the dining room table, and Zorro was sitting beside me. I had just gotten up to take my bowl to the kitchen sink, when I saw a shadow about eye level move across my line of vision, from the living room towards the bathroom. I was so startled that I dropped my cereal bowl on the floor, and all the milk made a huge mess. When I got up the nerve to check out the bathroom a few minutes later, there was nothing there. That was my first experience with the ghost I called Arthur. I never “saw” Arthur again. But at some point he discovered my electronics. He liked to occasionally turn on the television. But his real joy was the stereo. If it wasn’t on, he would turn it on. And whether or not it was on, he would turn up the volume. WAY UP! (In case you were wondering, the stereo and the TV were both plugged into surge protectors.) After the first couple of severe startles, I got used to it. Eventually I met Jon, and he moved into my cute, little rambler. When I told him about Arthur, he didn’t believe me. I don’t think he believed in ghosts at all… Jon also thought his stereo was nicer than mine, so he hooked his up. Arthur loved the new stereo! I believe the first time Arthur tried it out was about 12:30 in the morning, and we were both fast asleep! Arthur cranked that sucker up and scared the bejesus out of us! I wonder if he was just trying to let Jon know that he really should believe. But Arthur usually just played around during the day, every couple of months and fortunately never when we had guests over. And I must say, even with Arthur’s love of music, I never felt uncomfortable in the house. After initially being startled by the loud noise, I didn’t remain scared. I just chalked it up to the goings on of an elderly man who was just waiting for Doris to join him. Ghost or no? What do you believe? Even as the weather is turning cold and stormy, I was craving a white wine. Luckily I had a few on hand, so I uncorked a bottle of King Estate 2011 Pinot Gris. King Estate is one of the larger Oregon wine producers, located in Eugene Oregon. They have four lines of wines; King Estate Signature, King Estate Domaine, Acrobat and NxNW (North by Northwest). 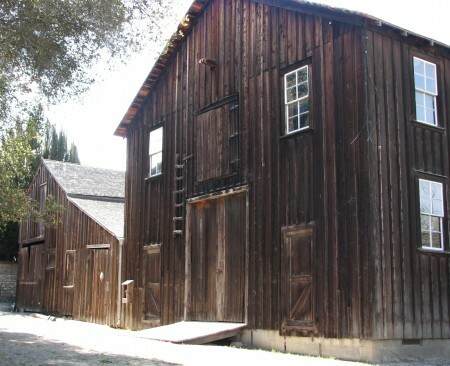 Their winery and tasting room also contains a fine dining restaurant, and they offer tours of the wine facility. 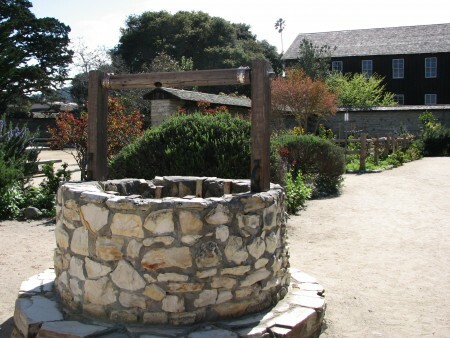 I haven’t been there, because we generally try to visit the smaller producers, but it looks to have a lovely patio with a pretty view of the vineyards. The 2011 King Estate Signature Pinot Gris is a nice Oregon style Gris, aged for 5 months in stainless steel. It has a crisp, bright acidity and a peach and pineapple nose. The flavor is tart balanced with sweet, with flavors of crisp green apple, and a touch of lime. The perfect kind of wine for a hot day on the patio. The kind of day I wish weren’t nine months away… Cheers! I live in the woods. Despite living only a mile from the downtown core, our yard is very wooded and we are right near one of our city’s largest parks, a natural arboretum. So Sunday, I decided that rather than taking a walk, I would get my daily exercise in the yard. 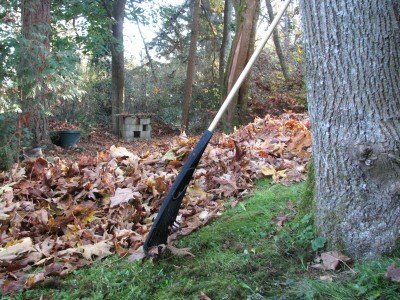 Raking up the gazillions of leaves that have fallen in the last week. 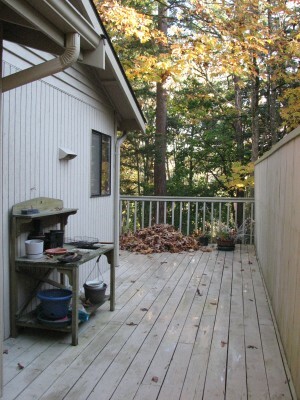 I started with the deck. 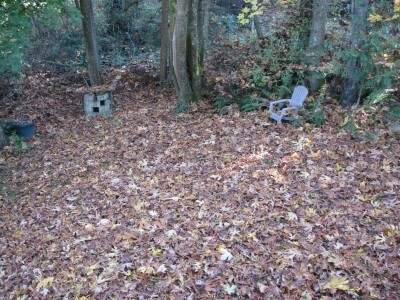 I swept all of the leaves into a pile, and then pitched the pile over the railing down to the yard below. That was the easy part. 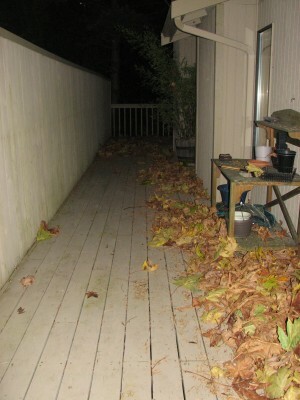 Once I had the deck cleaned off, I went down into the yard to continue. 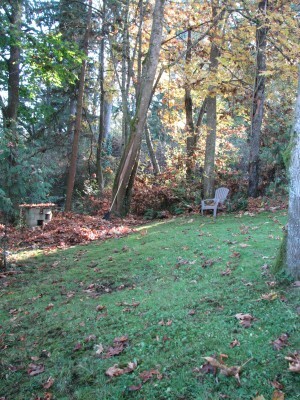 When I began there was barely any green grass (or more accurately, green moss) peeking through. 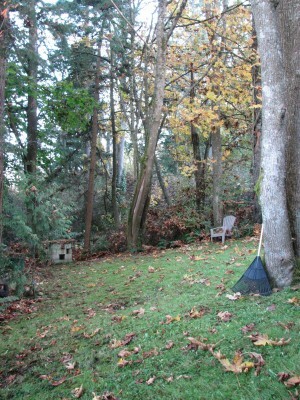 I started raking the leaves downhill toward the corner of the yard. It didn’t take too long before I was hot. So I took off my fleece. That helped for a little while, but then I needed some iced tea. It took awhile before I felt like I was making progress, but eventually I could see some bare grass (or moss). By this time my arms were on fire! Getting Close! My arms are on fire! Finally, exhausted, I finished my work. What a feeling of success! 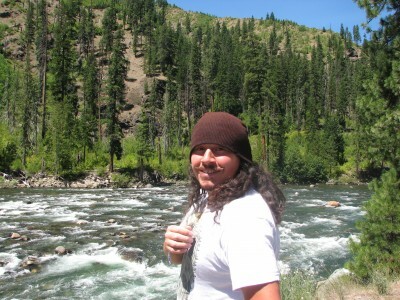 After spending a July day in Seattle hanging out with friends and family, Jon, Pablo and I headed out for Leavenworth. Jon’s sister and brother in law would be joining us later that day, as well as Jon’s parents and brother. We headed over the pass on Highway 2 – enjoying the scenery along the way, and stopping along the river to take some photos and enjoy the view. If you haven’t been over WA Highway 2, it is a beautiful scenic drive – more like a country road in most parts – two lanes that wind along next to the river. Once we got to Leavenworth, our first stop was at Smallwood’s Harvest, a local farm stand and retail store featuring many local products and produce. Jon, Pablo and I got some salad dressing, some peach cider, fresh peaches, and some jalapeño stuffed green olives. Jon really liked the green olives – I accidentally ate one and my tongue and lips were on fire for the next several hours! Also at Smallwood’s is a kitchen shop, with all sorts of neat kitchen gadgets. If we lived in the area, I think this would be someplace to check out regularly – just to see what kinds of local items they had! By this time we were hungry, so we decided to stop by Milepost 111 Brewery in Cashmere, WA (just one town over from Leavenworth on Highway 2). It was a hot day, but we sat outside in the shade on their patio, and were comfortable. They do brew small quantities of their own beer, but they happened to be sold out the day that we were there. They have a large selection of Northwest microbrews, including several from around the Leavenworth area. 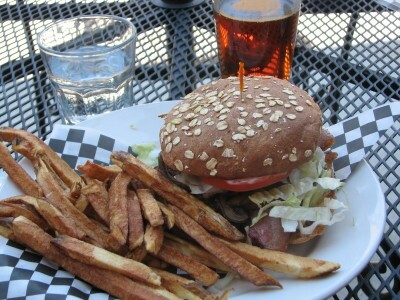 I ordered the Bacon Bleu Cheese Burger – with gorgonzola cheese and sauteed mushrooms – YUM! It was served with Truffle Fries, and I loved the meal! I paired it with a Dirty Face Amber Lager by Icicle Brewery in Leavenworth, which was a nice malty amber lager that was very smooth and approachable. Jon had the Salmon Fish and Chips and Pablo had the Pineapple Express Burger, they were both really pleased with their meals as well. My Bacon Bleu Burger with Gorgonzola Cheese and Sauteed Mushroooms – Scrumptious! 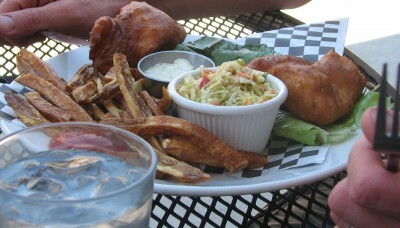 Jon’s Salmon Fish and Chips at the Milepost 111 Brewery – YUM! After hanging out on the patio for a couple of hours, it was time to check out our cabin. 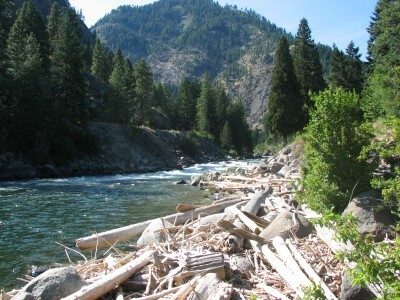 Jon’s sister had rented a cabin for the weekend that was right on the Wenatchee River, overlooking a section of rapids. We checked into the cabin, dropped our stuff in our rooms, and went down to the river! By that time of the afternoon, it was really hot – close to 100 degrees, so dipping our toes into the frigid water felt really good. Dipping the whole body was quite a different matter. That water was cold! REALLY COLD! I don’t think I had ever been swimming in water so cold – it is mountain melt, and is pretty close to the source in Leavenworth. It took a few minutes to get acclimated, but once you were in, the crisp cold water felt really good. Of course, it isn’t water you can lounge around in for the whole afternoon… but for later in the evening there was a hot tub. 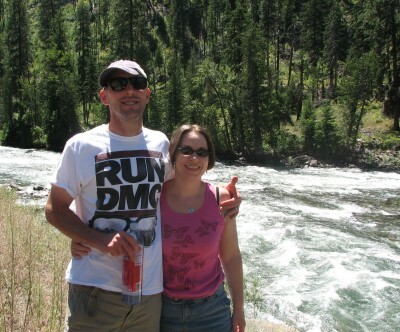 Our Section of the Wenatchee River – Super Cold Water! Jon’s sister and her husband treated us to dinner that evening – homemade seafood paella. Paella is complicated to make, requiring many steps to turn out a finished product, so I was excited to have some outside of a restaurant. It is one of my favorite dishes, and we all really enjoyed it. It was a great day to relax and enjoy ourselves! Yesterday, Biz had some new X-rays on his teeth to determine whether there has been more progression in the deterioration of his teeth. If you have followed this blog, you know that Biz has EOTRH, which causes the roots of the teeth to break down and become spongy, eventually undermining the stability of the tooth. Biz had a second tooth pulled back in May, and since then we have been watching a third. With the fall change in weather, he started dropping a bit of weight, something he has been known to do even before his teeth went bad, but lately he has also been showing more signs of pain in his gums. 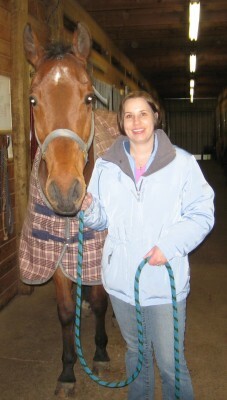 The vet arrived, and after the exam, diagnosed a case of gas colic. A horse’s digestive system is very sensitive, and since they are designed to graze all day, the stomach isn’t intended to hold much food. It is supposed to move into the small intestine (over 75 feet long in a horse!) relatively quickly to begin digestion. If the food doesn’t move quickly enough into the intestines, it will start to ferment in the stomach, causing gas. Almost all horses can’t burp or vomit (although I did have a mare who could burp the most fouling smelling burps, always in your face, but that’s a story for another time), so gas causes extreme discomfort. Fortunately, we caught his colic early, because it can be fatal for horses if left untreated. Eventually the discomfort will cause the horse to want to get down on the ground and roll to relieve the pain, but doing that can cause the intestine to twist and cut off the blood supply. The only treatment at that point is surgical intervention, which is complicated and dangerous. Biz’s colic was likely caused by the fact that he was sedated yesterday for the X-rays, slowing down the body’s processes, including digestion. That slow down was enough to cause the colic. REAR! LEAP FORWARD! Drag Camille and the vet along with him! That was the routine. Quite impressive really, considering he hasn’t been trained in these maneuvers – if you want to check out his airs above the ground, they looked something like these. After about a dozen attempts to intubate him, a minor rope burn on my finger, and coming close to a shoulder dislocation (my shoulder, not his), I could barely conceal my relief when the vet concluded that we needed to try Plan B. Plan B was a mild, short-acting sedative for Biz – sadly I wasn’t offered any – by that time I needed some! It worked like a charm, the tube went in, followed by about a gallon of electrolyte solution and a Costco size bottle of mineral oil. Apparently mineral oil prevents gas from forming – I never knew this, but it is certainly information that could come in handy! Biz got some immediate relief, and I spent the next couple of hours watching him walk around, first in the arena, and then later, in his small outdoor field. He was interested in nibbling a little grass, and was clearly more comfortable. Crisis averted. Back in July (really, was it that long ago?) Jon and I took a long weekend to go visit Leavenworth. That’s the Leavenworth in Washington, not the Leavenworth in Kansas, even though you may be surprised by that, given my fascination with prisons! Jon’s family had rented a cabin on the river to have a little family getaway, and Jon’s friend Pablo was coming to visit from California, so we took an extra day off on Friday to do a bit of touristing in Seattle. We had lunch at Coastal Kitchen, which is a restaurant about a mile away from Jon’s sister’s house, so we walked up there on a beautiful sunny day for a relaxing lunch. 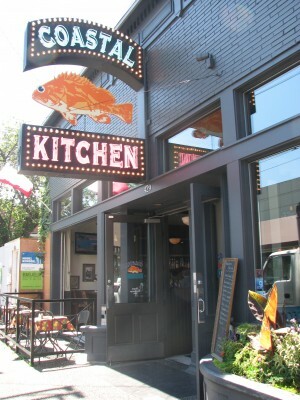 Coastal Kitchen specializes in seafood and oysters, featuring an oyster bar and a rotating featured region. The menu contains items from the featured region, often changed-up with some foodie flair – when we were there it was Veracruz, Mexico. I pondered the menu and was intrigued by the Garnachas de Masa, described on the menu as “a Veracruz street-food classic gone Coastal. 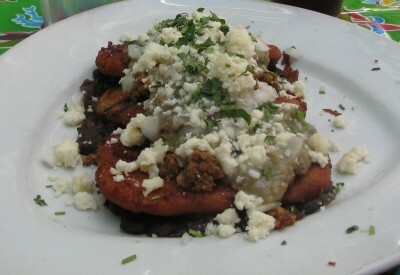 Crispy sweet potato and masa shells on a bed of bandito black beans sporting a booty of chorizo and chopped oysters. With sidekicks queso fresco and lime crema.” I ordered it, even though I had no idea what it would be like. Coastal Kitchen’s Garnachas de Masa – Delicious! I was so pleasantly surprised! This meal was awesome! It burst with flavor with every bite – and each bite was different with the crunchy sweet potato masa and the toppings of chorizo and small bits of oysters. The lime crema was fantastic! 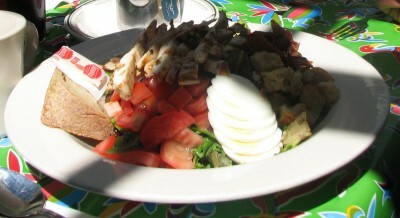 Jon played it safe with a Cobb salad – he said it was very good, but it couldn’t have been anywhere near as good as mine! I will certainly check out Coastal Kitchen again – and if you want to check it out, they are still currently featuring Veracruz.